Today marks the first day of the 2014 Lucille Ball Comedy Festival in Jamestown, NY! The festival, which is designed to showcase the best in the comedy biz, will feature acts such as Lucie Arnaz, Jay Leno, and Tom Cotter. James Sheridan, author of the Lucille Ball FAQ will also be there to sign copies and to give his expert opinion on America’s favorite redhead. Below, James tells us a bit about the history of the festival and what to expect. We hope you all have your tickets! On August 6, 1911, Lucille Ball was born in Jamestown, New York. On August 6, 2014, the annual Lucille Ball Festival of Comedy will commence in Jamestown, New York. Lucille Ball spent her formative years in Jamestown and this was evident in her work. Her long running sitcom characters Lucy Ricardo, Lucy Carmichael, and Lucy Carter all hailed from Jamestown and there were many references to the city, its surroundings, and its inhabitants throughout the years. For instance, nearly every woman in Lucy Ricardo’s women’s club on I Love Lucy was named after a citizen of Jamestown who Lucy knew in her youth. Since Lucille Ball was described as Jamestown’s greatest export, it was only natural they would honor her in some way. In the late 1980s, the city approached Lucy about hosting a festival for new comedy in her honor. Lucy loved the idea of promoting rising young comedians, but passed away one month before she was scheduled to attend the first such event in May of 1989. The festival officially launched in two years later with Lucy’s daughter, Lucie Arnaz, as guest of honor. The festival expanded, but with the opening of the Lucy – Desi Museum in 1996, its focus became more about Lucy and less on comedy. In the past few of years, the event has struck a happy medium by going back to the original idea of promoting comedy that pleased Lucy so much, but with enough Lucy themed events to enthrall the hundreds of fans who attend every year. A Comedy Hall of Fame is currently in the planning stages. This year’s festival will feature Lucie Arnaz, Jay Leno, Caroline Rhea, and America’s Got Talent finalist Tom Cotter. 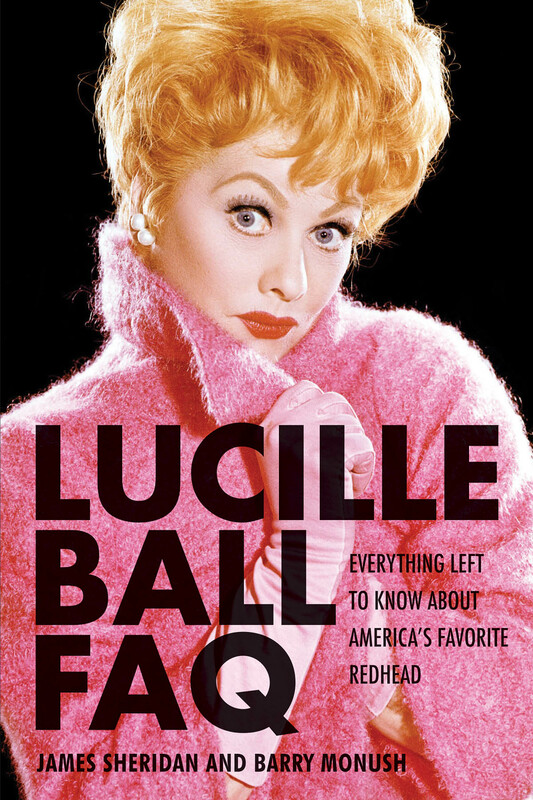 I will be on hand to sign copies of Lucille Ball FAQ: Everything Left to Know About America’s Favorite Redhead. Events will include a Lucille Ball fashion show hosted by costume designer Ret Turner, an I Love Lucy trivia contest, a masquerade ball, and various screenings of Lucy programs. Hundreds of fans from all over the world are expected for the five days of events, which is sure to be a laugh riot. In honor of the famous comedienne, enjoy a guest post by James Sheridan, author of Lucille Ball FAQ. Unlike many performers who began a motion picture career during the Golden Age of Hollywood, Lucille Ball did not get her start on the Broadway stage or in radio. Instead, Lucille Ball’s career as a model led her to the movie capital of the world. In the late 1920s and early 1930s, Lucille Ball was a young aspiring actress from Jamestown, New York trying to find a part in New York City. Unable to secure employment as a Broadway chorus girl, Ball chose to seek modeling work. She was soon working for the renowned designer Hattie Carnegie, but eventually moved on to a clothing store on Seventh Avenue owned by Mr. and Mrs. E.A. Jackson. One sweltering Wednesday in July 1933, Lucy was walking down Broadway in front of the Palace Theatre when she was stopped by an acquaintance, agent Sylvia Hahlo. Hahlo told Lucy that Samuel Goldwyn needed a showgirl immediately for the Eddie Cantor film Roman Scandals. Twelve girls were required, and one of the ones selected had to drop out because her mother would not let her go to California. Hahlo sent Lucille upstairs to Goldwyn’s New York representative Jim Mulvey, whose office was in the Palace building. All of the girls were required to be poster girls, which Lucy indeed was. Lucy was the “Chesterfield Girl,” since a portrait of her painted by artist Walter Ratterman was used on billboards for Chesterfield Cigarettes. Lucy was hired as a Goldwyn Girl at a salary of $125 a week for what was originally supposed to be a six-week job. Lucy and the eleven other girls left New York for California three days later. The assignment for six weeks of work led to fifty-six years of continuous employment for Lucille Ball. Onstage and Backstage podcast from Hal Leonard is available on iTunes and Libsyn. Each episode authors and their guests have a chat about the topics of their books. Today, James Sheridan, co-author of Lucille Ball FAQ (with Barry Monush), joins Patrick Phillips on The Patrick Phillips Show. Re-posted here with permission of Patrick Phillips. Although countless books and articles have been written about Lucille Ball, most people know only the surface details of her personal life and some basic facts about her popular television series. Lucille Ball FAQ takes us beyond the “Lucy” character to give readers information that might not be common knowledge about one of the world’s most beloved entertainers. It can be read straight through, but the FAQ format also invites readers to pick it up and dig in at any point. James Sheridan and Barry Monush go beyond the well known facts, making this an indispensable book for all Lucille Ball fans! Happy Birthday, Lucy! To celebrate 101 years of Lucille Ball, we’re giving you a pop quiz from the class we’ve just made up called “Lucy 101: 101 Years of Lucille Ball.” Post your answers in comments, and the first person to post with all four correct answers AND INCLUDE THEIR EMAIL ADDRESS will win a free copy of Lucille Ball FAQ by James Sheridan and Barry Monush (Applause Books). Ready? You may begin. 1. In what year did I Love Lucy premiere? 2. Why was Lucy’s Broadway debut in opening night of Wildcats delayed? 3. The birth of Lucy’s baby on January 19 became the biggest story in the news the next morning, even overshadowing coverage on the inauguration of which U.S. president? 4. What is the name of Lucy’s second husband? Although countless books and articles have been written about Lucille Ball, most people know only the surface details of her personal life and some basic facts about her popular television series. Lucille Ball FAQ takes us beyond the “Lucy” character to give readers information that might not be common knowledge about one of the world’s most beloved entertainers. It can be read straight through, but the FAQ format also invites readers to pick it up and dig in at any point.